“Have you been convicted of a crime?” Kansas Citians and job seekers in 31 states, the District of Columbia and over 150 cities and counties across the country should not be asked that question on employment applications under the law. Chances are you’ve probably heard of this fair hiring policy sweeping across the country. “Ban the box” laws refer to the “box” on job application forms asking prospective employees if they have been convicted of a crime. The policy requires hiring managers to put off asking about a job seeker’s criminal history until after an interview has been conducted, or in some cases until a provisional job offer has been made. The goal of ban the box laws are to get employers to consider an applicant’s qualifications first, making it easier for job seekers with a conviction history to re-enter the job force and obtain employment. Initially, many ban the box laws only applied to the public sector. However, according to National Employment Law Project (NELP), as of April 2018, 11 states, 17 cities and counties had extended the policies to private employers. States include California, Connecticut, Hawaii, Illinois, Massachusetts, Minnesota, New Jersey, Oregon, Rhode Island, Vermont and Washington. In fact, in Kansas City ban the box laws will take effect for private employers on June 9, 2018, following an ordinance passed by the City Council last February. Under the new rules of Section 38-104, Kansas City employers with six or more employees—public and private—will be prohibited from making hiring or promotional decision inquiries into a prospective employee’s criminal history until after determining that the individual is otherwise qualified for the position, and only after the applicant has been interviewed for the position. It is important to note, employers will not be prevented from inquiring about an applicant’s criminal history, rather the new law will delay the inquiry. Exceptions to the law include positions where applicants with certain convictions are required to be excluded due to local, state and federal law or regulation and positions where the applicant’s criminal history are reasonably related to the duties and responsibilities of the position. To ensure compliance* employers should amend job applications by June 9, 2018, removing any questions about prior criminal history. Team members responsible for recruiting and hiring should be educated on topics to avoid to prevent illegal inquiries. Third party background checks, if part of your hiring process, should be timed appropriately. Under the new law, they should only be administered after it has been determined the applicant is qualified and an interview has taken place. Additionally, know what to do under the new law should a background check reveal prior convictions. The Kansas City ordinance requires employers to consider frequency, recentness and relatedness of the criminal history to the position the applicant is seeking. Watch Sherri, one of our experienced Human Resources Consultants here at Axcet, as she brings business owners and HR professionals up to speed on the fair chance hiring policy. While the removal of the check box indicating conviction of a crime attempts to make life easier for certain job seekers, it has created confusion and compliance risks for employers. 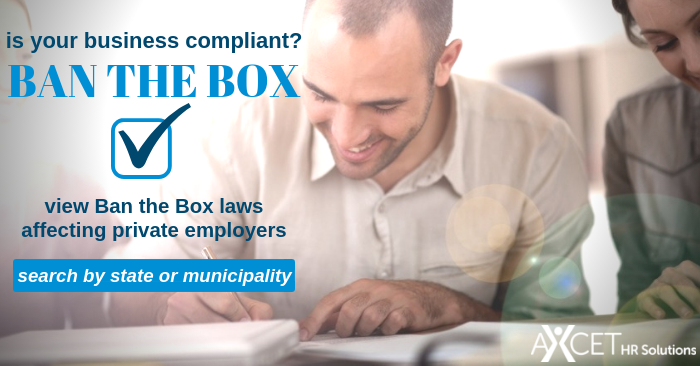 In our FREE REPORT we break down ban the box laws by state, key municipalities and covered employers plus we include additional information you need to know. Download it today. * Disclaimer: The content offered is offered only as a public service and does not constitute solicitation or provision of legal advice. This site should not be used as a substitute for obtaining legal advice from an attorney licensed or authorized to practice in your jurisdiction. You should always consult a suitably qualified attorney regarding any specific legal problem or matter.